Adonis Stevenson will defend his WBC World light heavyweight title on July 29th at the Centre Videotron, in Quebec City, Quebec, against Thomas Williams Jr. “Superman” Stevenson won this belt in June of 2013 and has since defended his title successfully in six occasions. 38 year old Stevenson will collide against an opponent ten years younger and several inches taller, a southpaw just like him, but Stevenson still holds the reach advantage and the higher KO percentage. This is a great opportunity and at the same time a very tough challenge for Williams, a native of Fort Washington, Maryland, he is getting the first world title shot in his career; the only loss he has in his record came by KO at the hands of Gabriel Campillo; he has 20 wins in his professional record, 14 of these by KO; Williams’ biggest problem is that he takes unnecessary punishment in his fights and this could be a massive mistake against an opponent like Stevenson; hopefully his trainer has him working on his defense especially considering Stevenson’s reach and hand speed. Stevenson, the Haiti native based in Montreal, accumulates 27 wins, 22 by KO and only 1 loss by TKO that happened back in 2009, Williamson is probably one of the stronger punchers he has faced, Stevenson has been away from the ring for ten months but has remained active in the gym. He usually exhibits a great physical condition but has been criticized for the quality of his opposition. We all want to see him face Sergey Kovalev, a fight that as time goes by seems more unlikely to happen, perhaps we’ll get to see him against Andre Ward at some point. Superman has an impressive left jab; but he also has some holes in his defense that could give Williams a fighting chance. Stevenson is certainly the better fighter and Williams is somewhat of a “safe” opponent for him, he really needs to agree to face higher level contenders, his last fight left a lot of frustrated fans. Williams can fight, and more importantly, he is a hungry young fighter, and that can take him a long way, so hopefully styles will make for a great fight and the next light heavyweight title match we get to see is of a higher level. Stevenson is the favorite to win with a line of -500 while Williams shows a +400, Stevenson is the safer bet and Williams is a great value bet; yet I don’t think Williams will be able to handle the pressure and pull this upset, so my money is on Stevenson to win by KO. If you like to bet on boxing, AceSportsbook.com is the place to be. 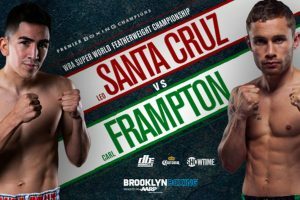 Bet the Adonis Stevenson vs. Thomas Williams fight on July 29th and while you are at it check out the odds for the Leo Santa Cruz vs. Carl Frampton title match that will happen July 30th.